At Driveway Dumpsters, our trash removal service extends all the way from Pittsburgh, PA in the west to Greensburg, Latrobe, and Derry in the east. 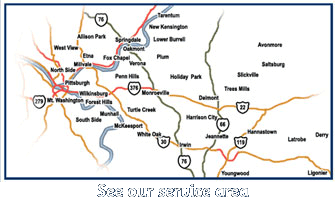 Our service area includes but is not limited to the following towns and municipalities: Allegheny and Westmoreland Counties, Allison Park, Apollo, Avonmore, Blawnox, Bloomfield, Braddock, Cheswick, Churchill, Delmont, Derry, Duquesne, East Liberty, East Pittsburgh, Edgewood, Etna, Export, Fox Chapel, Garfield, Glassport, Glenwood, Greensburg, Hannastown, Harmarville, Harrison City, Hempfield Township, Highland Park, Holiday Park, Hunker, Indiana Township, Irwin, Jeannette, Latrobe, Lawrenceville, Leechburg, Lower Burrell, McKeesport, Millvale, Monroeville, Mt. 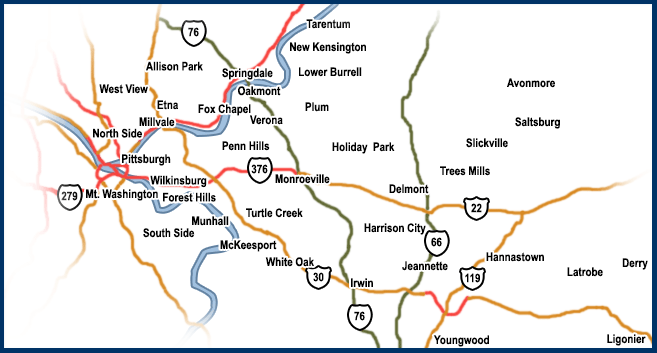 Washington, Murrysville, New Kensington, North Huntingdon, North Side, North Washington Township, North Versailles, Oakmont, Ohara Township, Penn Hills, Penn Township, Pittsburgh, Plum Boro, Point Breeze, Rankin, Salem Township, Trees Mills, Troy Hill, Saltsburg, Shadyside, Shaler, Sharpsburg, South Side, Springdale, Squirrel Hill, Swissvale, Tarentum, Turtle Creek, Vandergrift, Verona, Wall, White Oak, Wilkinsburg, and Youngwood.